Aortic dissection is an uncommon disease that often presents with varied and atypical findings suggestive of more frequently encountered conditions; therefore, it poses an exceptional diagnostic challenge to emergency providers. Mortality associated with aortic dissection is significant at presentation and advances with every hour the lesion is left untreated. Although almost all patients who have symptoms possibly caused by aortic dissection will not have aortic dissection, key features of the disease, including risk factors, pain characteristics, physical examination findings, and routine ancillary studies, allow clinicians to develop a rational approach to diagnostic testing. When the diagnosis is sufficiently likely to indicate definitive testing, computed tomography angiography is the advanced imaging test of choice in most centers, but transesophageal echocardiography and MRI may be appropriate alternatives in certain circumstances. 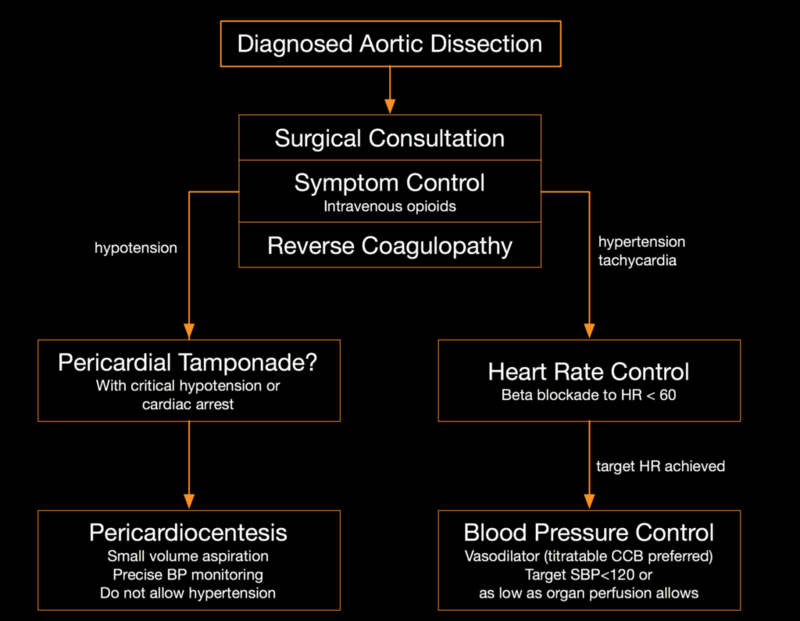 Patients with diagnosed or strongly suspected aortic dissection require expeditious surgical evaluation, aggressive analgesia and anxiolysis, and treatment with rapid-acting, titratable agents to first lower heart rate, and then blood pressure, to specific targets."